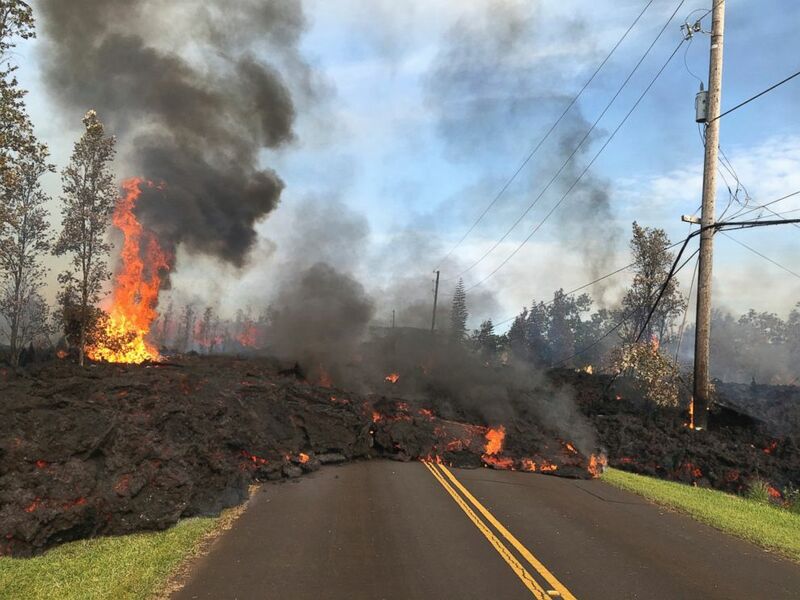 After a day of relative calm, Kilauea roared back in full force on Sunday, spewing lava 300 feet in the air, encroaching on a half mile of new ground and bringing the total number of destroyed structures to 35. Add Volcanoes as an interest to stay up to date on the latest Volcanoes news, video, and analysis from ABC News. Activity from the volcano, which erupted on Hawaii's Big Island on Thursday, also opened new vents on Sunday, bringing the total to at least 12 by Monday, according to Hawaii's Civil Defense Agency. The agency said Monday many of the vents which had caused so much destruction on Sunday had calmed down. 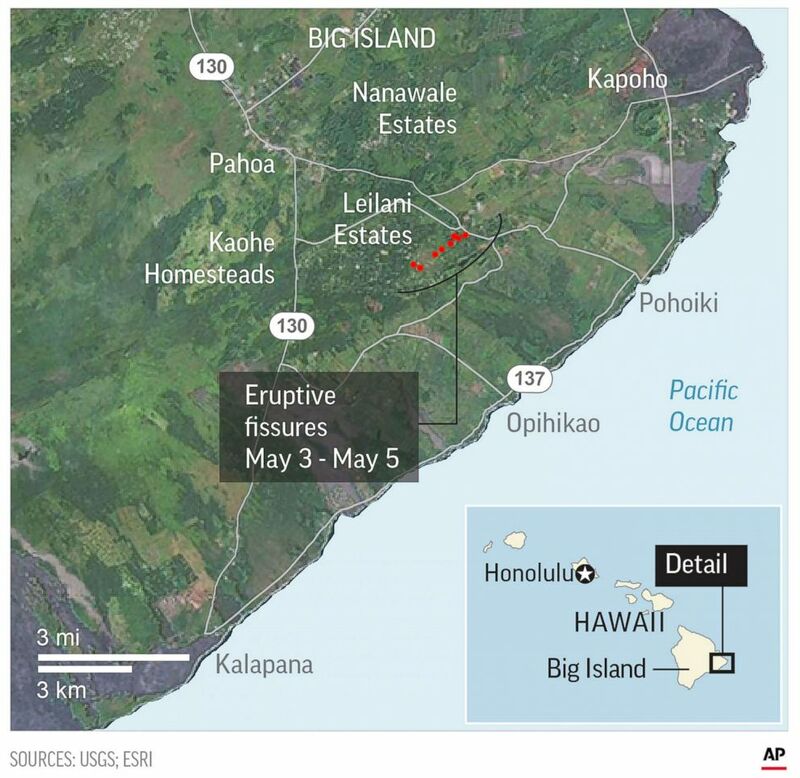 There have been 1,800 residents evacuated from their homes in the Leilani Estates and Lanipuna Gardens neighborhoods where cracks have been opening and spilling lava into the subdivisions. "There's no sign of this slowing down," Hawaii's Civil Defense Administrator Talmadge Magno said Sunday. "We had some pauses yesterday, but there seems to be a lot of magma underground." A fissure eruption in the Leilani Gardens neighborhood on Hawaii's Big Island consumed homes on Sunday, May 6, 2018. Magno also said Sunday about a dozen residents have decided to stay in their homes, despite the evacuation order. "We've got a loose number," he said. "I'm not sure how extensive a survey was done, but there are still people who are out there as far in their residences." In evacuated areas with relatively low sulfur dioxide levels, residents were allowed to return home for a few hours to collect belongings on Sunday and Monday. Officials said those residents -- a little more than half of the evacuees -- were allowed to return briefly, and Magno said they would continue to allow residents in if it could be done safely. "We've gotta be careful because the SO2 levels are still pretty high," Magno said. "We're not going to let them stay." Puna Geothermal (an energy conversion plant) has moved flammables uphill in case anything starts flowing near them. 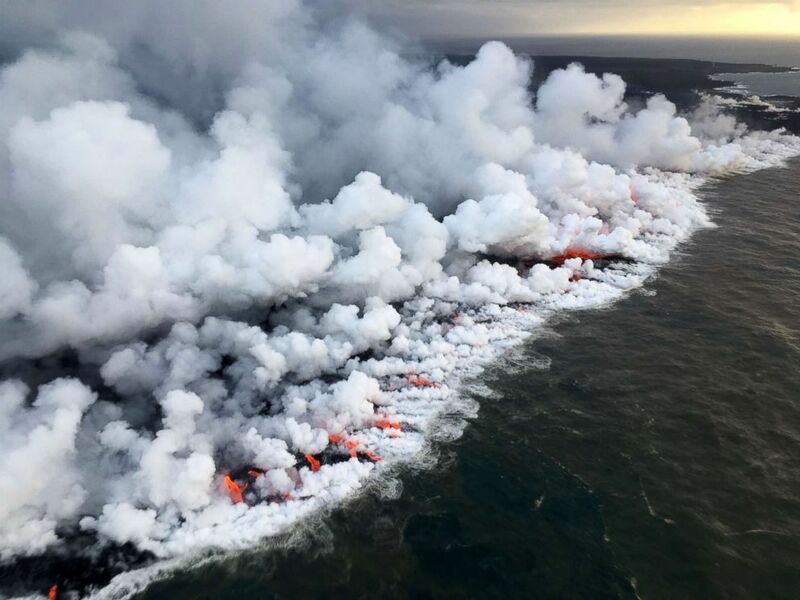 The activity had heightened Saturday morning, with officials saying the lava from multiple the vents had joined together in a concerning scenario. However, the activity slowed later in the day before starting back up again early Sunday. Magno told ABC News that the Civil Defense Agency was starting to prepare for the worst. "It ramps up our response more. ... Even though you're thinking about the worst-case scenario, it's starting to come to fruition, so you go, 'OK, we need to get ready for that worst-case scenario,'" Magno told ABC News correspondent Marci Gonzalez. This map shows eruptive fissures in Hawaii. "Things got pretty active [Saturday morning]," Magno said at a Saturday press conference. "The eight vents were pretty active, to the point where lava was spewing and the flow started spreading so we got additional damage out there. I'm not sure what the count is, but we thought it was just continue to go. Fortunately, seismicity has kinda laid down and the vents have gone quiet now." 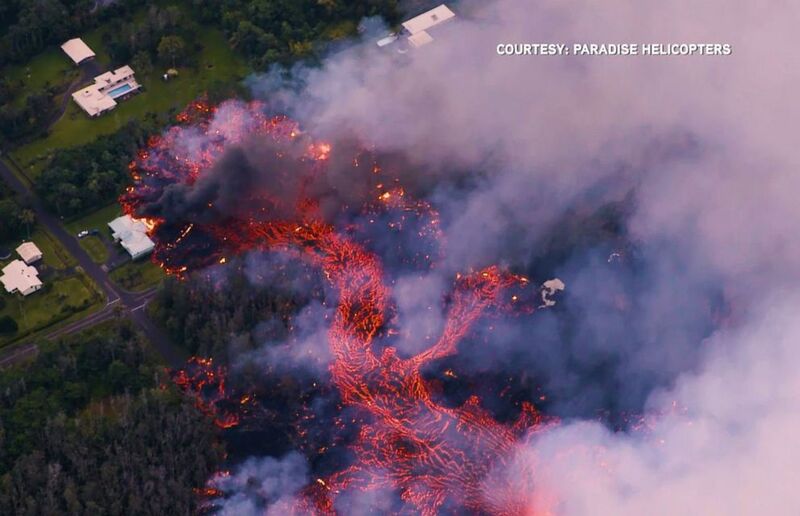 But officials had cautioned that while the lava flow was quiet, it wouldn't be for long. "More vents could open up, the existing ones could get active again, which probably will happen after seeing what happened this morning," Magno said. "There's a lot of lava or magma under the ground so eventually it's going to come up." In this Saturday, May 5, 2018, photo provided by the U.S. Geological Survey, lava from Fissure 7 slowly advances to the northeast on Hookapu Street in the Leilani Estates subdivision in Pahoa, Hawaii. Magno said Sunday that a combination of old vents and new vents were active. The island was also rocked by a 6.9-magnitude earthquake on Friday, which caused landslides near the coast, but minimal structural damage. The United States Geological Survey (USGS) said Sunday the island had experienced more than 500 earthquakes -- 13 with a magnitude greater than 4.0 -- in the 24 hours following the 6.9-magnitude quake. The concern for residents continues to be the lava and gas emitted from vents, though. 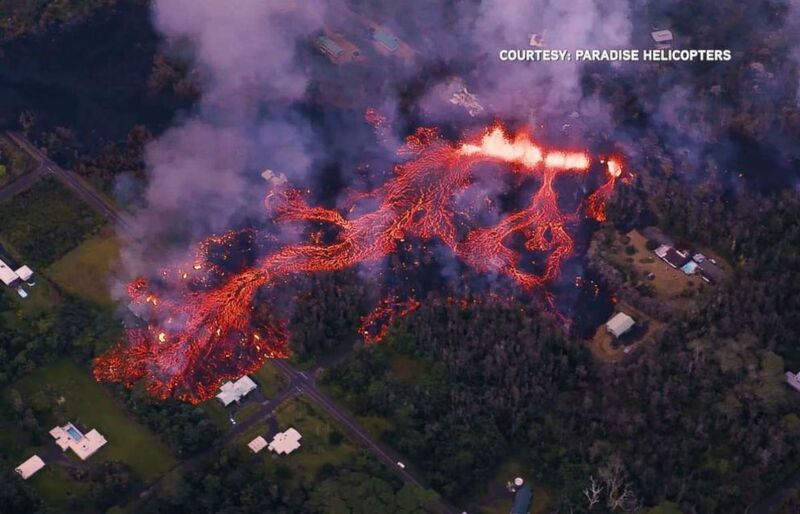 "This is lava, that is definitely destroying people's homes -- we don't have an exact count -- but it is a devastating situation and it's going to be everyday that it goes on," Hawaii County Managing Director Wil Okabe said Saturday. "Mother nature, there's no way we could've predicted this."